Micro Jack3d by USPLabs is one of the revamped formulas of their very famous Original Jack3d which was taken off the market in mid-2012 for its use of 1.3 dimethylamylamine, or DMAA. The original Jack3d is regarded as being one of the best pwos ever marketed for its energy and focus and many people were excited for it to back onto the market. 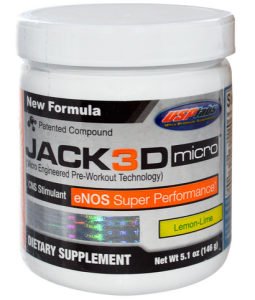 Micro Jack3d was marked to be just like the original Jack3d with a new “micro-engineered pre-workout technology” that was said to be better for absorption by your body. Micro Jack3d comes in three flavors fruit punch, sour cherry, and lemon-lime. The one I’ll be reviewing is the lemon-lime flavored one. Like most pre workouts, micro Jack3d comes in a small tub (smaller than the average pwo tub) and like other pwos has a few buzzwords on the front with the company logo and supplement information. When compared to other pwos designs, micro Jack3d is much less tacky as it doesn’t have any warnings or pictures you would associate with your typical supplement. It’s a very clean and aesthetically pleasing design. Taste/Mixability – Is it Any Good? When it comes to pwo flavors, lemon-lime is always a safe choice. Considering that it’s a very widely used flavoring and already has a very artificial taste, it would be a familiar taste to anyone who is trying it for the first time. This was true with micro jack3d, it was a very sweet lemon-lime flavor with a bit of a bitter after taste but it was definitely easy to drink. Its mixability, however was not that great. Although the micro jacked serving size of 3.65 grams is a very small when compared to other pwos, but also in general, it does not mix well. You end up with a very murky liquid with a slight yellow tinge with lots of floating pieces in it. Even using one scoop with 20+ mL in a shaker cup, it did not dissolve well. When you drink it you can feel the pieces and they cover your mouth and are extremely bitter when you bite into them. This made it a bit annoying to drink as I would have to have an extra cup or bottle of plain water at the same time to wash down the bits and pieces in my mouth. Although the taste was fine, its poor mixability made it a bit of a chore to use. Ingredient Profile – Is Micro Jack3d Safe? The ingredient profile in Micro Jack3d is pathetic and very embarrassing when you expect such a great product from a company like USPLabs. The scoop contains 2 proprietary blends, one called Super Performance System™ and another called CNS Contractile Stimulant System™. Proprietary blends are something that I suggest people stay away from. They are gimmicky, as you can tell from their names, but they also contain many useless additives that which means you’re spending money on unnecessary chemicals that will enter your body. The first propriety blend, Super Performance System™ contains L-Citrulline, Arginine and then other useless ingredients that are not even worth mentioning only if to say that they are useless. L-Citrulline is an amino acid which, when processed by your kidneys, becomes L-Arginine. L-Citrulline has been shown to help improve erection hardness in males with mild ED (http://www.ncbi.nlm.nih.gov/pubmed/21195829) so it helps dilate your blood vessels. The same is true for L-Arginine, the other ingredient in this blend. The next proprietary blend, CNS Contractile System™ contains caffeine, a well-known and studied stimulant as well as Noroclaurine HCL and 3,4-Dihydroxycinnamic Acid. Noroclaurine HCL which is derived from plants appears to have anti-asthmatic properties and fat burning properties like Epherdine, but this is limited evidence to back up these claims. 3.4 Dihydroxycinnamic Acid or Caffeic Acid, which is unrelated to caffeine, has some minor antioxidant properties, but there are no other studies that show any sort of effect during working out. Effectiveness/Results – Does it work? Micro Jack3d was an extremely disappointing pwo. Besides the very short burst energy from the miniscule amount of caffeine, which is also unknown due to the fact that it’s in a propriety blend which does not to disclose its mixture, the only energy I got came from the anger when I realize I just wasted $25 on a useless product. Its effectiveness is around 1-2 to the point where I think it made me even more tried than if I would have use nothing at all. There were no results, there was no pump, focus or energy. I did not feel anything when using this product it was a huge waste of money. I paid $25 for the large 146 gram tub of Micro Jack3d. It was a waste of money, and it was nothing more than a fancy tub of underpowered caffeine with fancy packaging and a “repeatable name slapped on it”. There is no value in this product, although it’s cheaper than most other pre workout supplements. I am honestly shocked at any good reviews of this product, maybe I got a bad batch but after using it 3 times I was angry and disappointed. The only thing I could think is that it was the placebo effect that people felt using a pre workout supplement that was coming from such a highly regarded brand which isn’t a bad thing because I believe that if it works, regardless of why, it’s good. But I gave this pwo multiple chances and each use was worse than the last. Overall Recap + Rating – Is it Banned? I would this product a 1-2/10 for its lack of effectiveness and poor value. Thankfully I accidentally spilled water in it and was forced to throw it out. Not only was this good because I was able to get rid of it, but because there have been 11, yes 11, different lawsuits against USPLabs nearly all of which included Jack3d or their other popular supplement OxyElite Pro all of which could be found online and include some dealing with DMAA which is no longer used to one that was just settled because of supposed organ damage. Besides being extremely disappointing, Jack3d was also a potentially harmful supplement to use. I would not only not do business with USPLabs, I would stay away and warn others of their products as they aren’t safe and are in the process of being banned. You can buy Micro Jack3d on sale by clicking here if you are still interested.